This summer Korean researchers have presented a new method for classifying the 2 'transversal' palmar lines - better known as the 'heart line' + 'head line'. In interesting aspect in their methodology is that they have defined beyond the classic simian line & Sydney line ... a third unusual hand line variant, which they have named the 'Suwon crease' (because it was discovered in the Korean place Suwon). Interestingly, this new hand line type was only seen in males! Figure 3: Types of palm creases based on the relationship between the proximal transverse crease (II) and distal transverse crease (III). Normal crease (A): II and III do not meet. 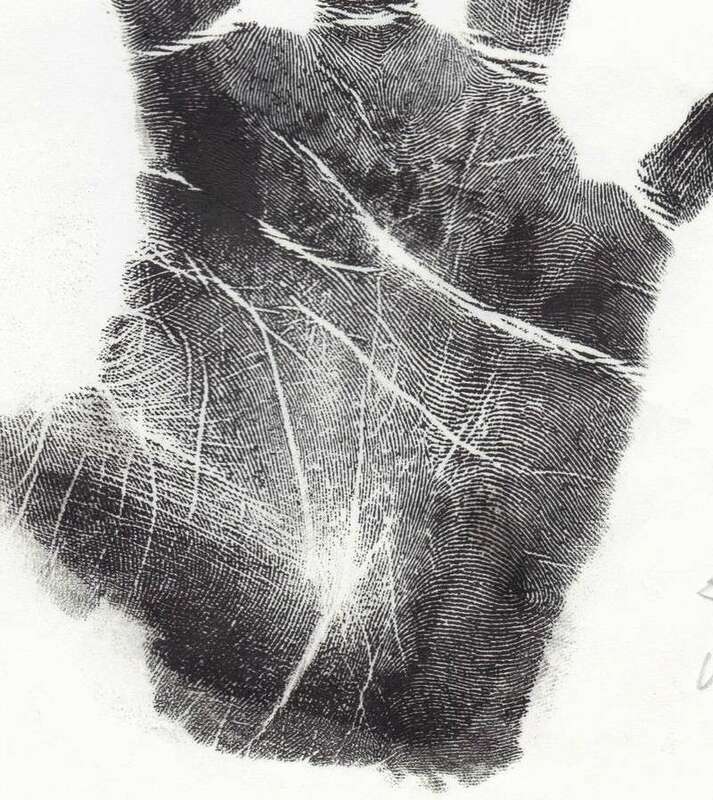 Simian crease (B): II and III meet to cross the palm. Sydney crease (C): II and III meet, accompanied by accessory III. Suwon crease (D): II and III meet accompanied by accessory II. 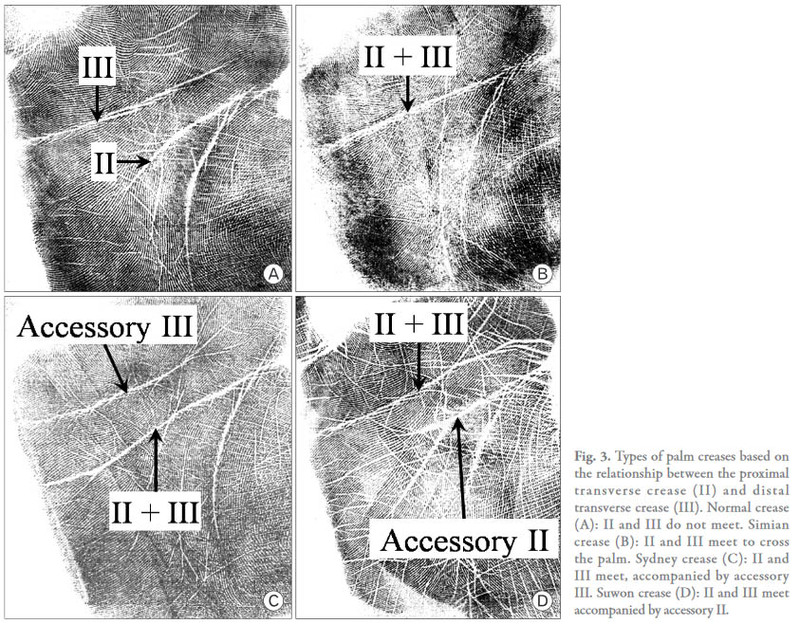 Figure 4: Subtypes of normal, simian, and Sydney creases based on the branches of the proximal transverse crease (II) and distal transverse crease (III). Normal 1: II and III do not meet absolutely. Normal 2: II and III meet by recurrent branches of II, III. Simian 1: Branch of II or III does not exist. Simian 2: Proximal branch of II exists. Simian 3: Distal branch of III exists. Simian 4: Proximal branch of II and distal branch of III exist. Simian 5: II and III meet by branches of II and III. Sydney 1: Branch of II or III does not exist. Sydney 2: Proximal branch of II exists. Sydney 3: Distal branch of III exists. Sydney 4: Proximal branch of II and distal branch of III exist. Sydney 5: II and accessory III meet by branches of II and accessory III. Sydney 6: II and accessory III meet by the recurrent branches of II and accessory III. Could you possibly explain this simply. Where is this line? Initially, I have problems myself to identify the 'Suwon crease' in picture D - for the description of the researchers is a bit confusing since they are referring to 2 lines. But in the picture below I have marked the 'Suwon crease' for you: it can be described as 'heart line' which completely transverse the palm (the combination of the orange + red line) - via a second line that can also be identified as a 'dissociated head line'. 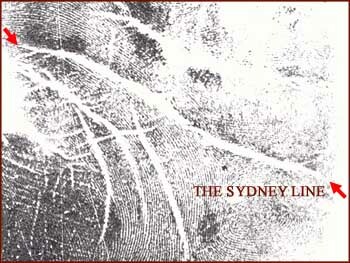 NOTICE: Just like the Sydney line, is the 'Suwon crease' a line which transverses the palm - however when a heartline transverses the full palm with only one single line (without branches/splittings), then it should not be recongnized as a 'Suwon crease': then it is imply a completely transversing heart line - though there is not common used name for that variant. I hope this now makes sense!? Thanks a lot. I see now what it is, but now wondering how it would be read in a reading. This weekend I have been thinking about the Suwon crease, and how the Korean researchers defined the Sydney line. I think their approach is very interesting, because it implicitely describes that both the Suwon crease and the Sydney line... are rather complex lines - actually they are both 'composed' by two lines (partly heartline + partly headline, and vice versa). I am not sure that this has EVER been described before in the literature. And this also provides a clue regarding how to descriminate a 'very long head line' (and Richard Unger's hall head line) from a Sydney line. Anway, I have started re-designing my PIC model with these new insights... don't worry: it will not become an even more complex variant. I am now planning to present a more simplified model with some relatively easy guidelines. Regarding the meaning of the Suwon line... well, since it has never been named before (and I think it was NEVER EVER described in the palmistry literature) it would be rather foulish to speculate about it's meaning - especially since so far it has not been described with many details. But I have now the tools available to study the occurence of this line in a Western (Dutch) population, and to investigate if this line relates the themes that I have introduced to far at my website (IQ, autism, Big Five personality dimensions, etc.). Example of the Sydney line that was presented by Purvis-Smith (1972): if we take a closer look at the historical very first illustration of a Sydney line, then you can see that it is actually composed of ... 2 elements!!! That's great and I am looking forward to reading your findings. Many thanks for this and all the other information. I have found the 'Suwon crease' in 4 males in a sample of 32 male university students (2x right hand, 2x left hand) which is rather remarkably high percentage compared to the Korean report - where it was observed in slightly more than 1% of the studied population. This suggests that the 'Suwon crease' very like has a completely different meaning than the 'simian crease' and the 'Sydney crease' which are both recognized by medical sience as MPA's (minor physical anomalies). So the frequency of 4 in a sample of 32 intelligent males (= 12.5%) suggests that the 'Suwon crease' could even be... a marker for high intelligence??? (Though I still have to check my 'control population' including 200 males, I already know that the percentage will for sure be much lower in that population). 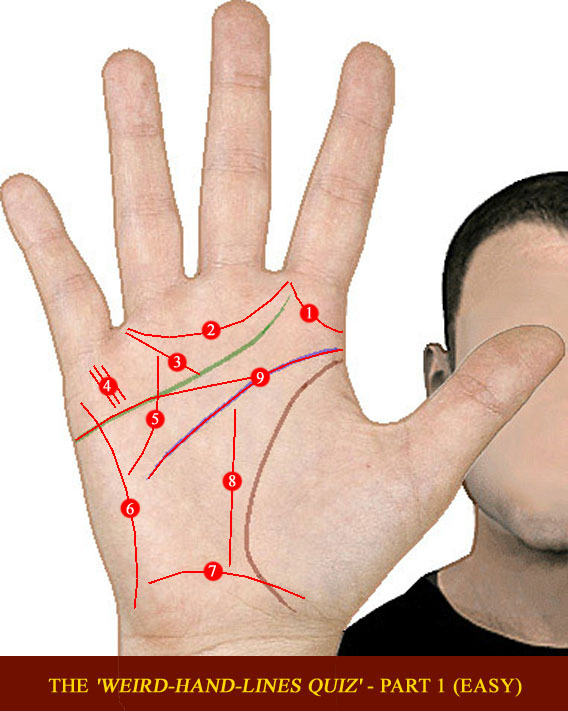 Another interesting early observation is that 3 out of the 4 'Suwon crease' males have a LOW score on the Big Five dimension Neuroticism - which again suggests that the meaning of this hand line is completely different compared to the 'simian line' (for, earlier studies revealed that the simian line has a link with HIGH scores on Neuroticism). - I have found 2 Suwon creases in a sample 42 Dutch university male students (= 4.8%) + 2 'incomplete' Suwon creases (=4.8%). - And I found 1 Suwon crease in sampe of 200 Dutch males (= 0.5%) + 2 'incomplete' Suwon creases (= 1.0%). gosh Martijn, I wish I had your brain capacity. How do you come up with these things, brilliant! I look forward to your "report about the occurence of the 'Suwon crease' in various Dutch female populations" as the researchers said it is only found in males and (I think) I remember 1 or 2 women with this line. Martijn, re your comment "I think it (Suwon line) was NEVER EVER described in the palmistry literature" I must check some research done by Christopher Jones & Felicity (argh, sorry I forgot Felicity's last name!) about 17 different endings to the heart line. I will check it out. Sounds interesting, I would love to hear more details about Christopher & Felicity's study! The 'tricky' aspect in the Korean study is that they really have given a fascinating interpretation of how to recognize a Sydney line as well. And I must say... it is a very sharp observation. I already discovered that some of the Sydney lines in Down's syndrome have the 2-aspects - but actually, that is only a minority of all Sydney lines that I have observed in this sample. Anyway, regarding the Suwon crease... it would be interesting to hear more details from you about the 2 women that you have in mind. Do you think you're able to present a sample from their hands anywhere in the future? Martijn (admin) wrote: The 'tricky' aspect in the Korean study is that they really have given a fascinating interpretation of how to recognize a Sydney line as well. And I must say... it is a very sharp observation. sorry, maybe late hour is cause of my confusion....which 2 aspects? maybe you noticed I deleted something from my original reply - about "I am not sure that all sydney lines are composed of 2 lines joining, but interesting observation that makes some sense"?? Martijn (admin) wrote: Anyway, regarding the Suwon crease... it would be interesting to hear more details from you about the 2 women that you have in mind. Do you think you're able to present a sample from their hands anywhere in the future? I think I have one poor quality handprint somewhere amongst piles of papers, and the other I don't have a print but could perhaps obtain one. so don't hold your breath! Lynn wrote: sorry, maybe late hour is cause of my confusion....which 2 aspects? OK I looked again, I guess 2 aspects are - Suwon crease (D): II and III meet accompanied by accessory II. 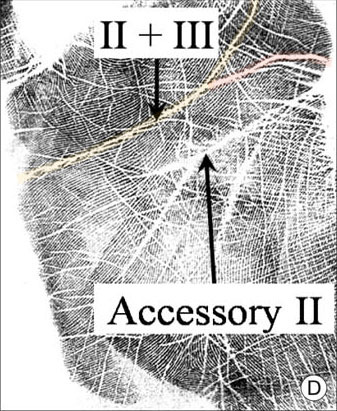 I am not convinced that it is II and III meeting with accessory II ? ie head and heart lines meeting with accessory head line. Why isn't it forked heartline? Yep, I think you got the idea about the basics of the Suwon crease... though I could add: the STRUCTURE of a 'Suwon line' should present a clue that the lower branch could be a second head line. This implicates that a perfectly normal 'splitting heart line' should NOT be described as a 'Suwon crease'! (At least, that is what I made out of the descriptions of the Korean researchers). Sorry Lynn, are you talking about my example? Or the researchers' example? Or the description in their article? Lynn wrote: sorry, maybe late hour is cause of my confusion....which 2 aspects? maybe you noticed I deleted something from my original reply - about "I am not sure that all sydney lines are composed of 2 lines joining, but interesting observation that makes some sense"?? Regarding the 2 components of the Sydney line - please take a look at the Sydney line example in the article (see below: picture C): I am quite sure that you will recognize the 2 components of the line very easily. And... please pay some attention on the ulnar side component: the structure really looks like it could be a second heart line - because the structure of the second component is even wider that the heartline itself! sorry I meant D, but also your example. I don't understand why "accessory II" isn't the main headline, and why suwon is II and III meeting rather than a long forked heartline. 'Accessory II' = the main headline. Regarding the 'II + III', the STRUCTURE of the lower branch (= II) is stronger than the rest of the heart line (= III)... which is very unusual for a normal splitting heartline - where the 2 'splitting branches' usually both a slightly weaker than the 'core branch'. One could argue that this could be the result of the in-flowing 'passion line'! So, I think it is important to look at the details regarding the structure of the various parts of the heartline - if one ignores those aspects than it will likely become impossibly to understand what the 'Suwon crease' is all about. I'm reading this thread for the first time and maybe am missing something. I thought a Sydney crease has no connection nor is it part of a heart line. Like Lynn I'm pretty sure I've seen this configuration on women as well as men. It's fairly common for there to be an additional branch on the heart line bending down to the life or head lines. What defines this Suwon crease from that? I don't really think this is something "discovered" as much as something "identified" and newly labeled by the scientific community. I imagine as time goes by these researchers will apply their names to all sorts of creases, combination and otherwise. Ok... I see that they are referring to the crease coming in from the Ulnar side. 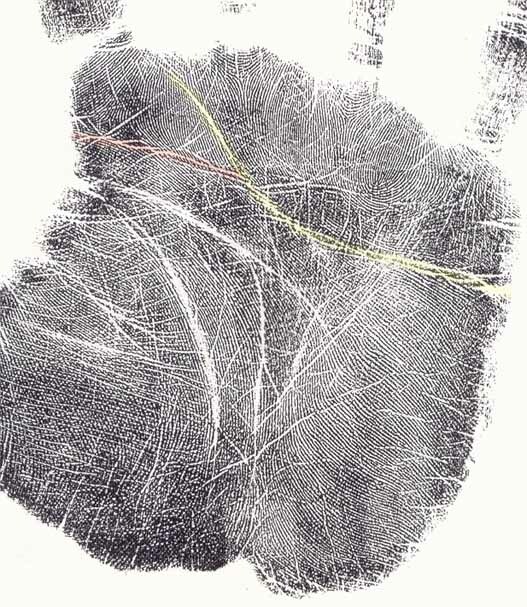 This crease has been described in palmistry literature. I'll try to remember who, but they referred to it as relating to a person being a natural psychologist. People reading skills. It would seem that the accessory crease on the radial side and the one on the ulnar side should have different labels or be additionally identified as radial and ulnar. "an additional branch on the heart line bending down to the life or head lines"
The 'Suwon crease' is featured with (1) the presence of an extra head line, which creates another (2) TRANSVERSAL line (from the thumbside of the palm to the heart line); and typically (3) this extra-line has structure which doesn't relate to the structure of the heart line. One can understand the nature of this line by thinking about a heart line which transverses the full palm - but of course: a 'completely transversing heart line' is just a relatively common variant of the heartline. But in the 'Suwon crease' a likewise construction is seen, however the difference is that there are 2 different lines involved - so, to recognize this a true 'Suwon crease' one really has to consider the STRUCTURE of the lines involved. Patti, what you described is indeed nothing more than a perfectly normal variant. However, when a heart line 'branches' into two lines one will typically notice that the strength of both branches is less pronounced/less strong than the other side the heart line under the pinky finger (where both branches are still one single line). So, a 'Suwon crease' will typically manifest as a line which has a likewise strength as the first part of the head line + a different structure compared to the heart line. - (3) the extra line has a likewise strong structure as the first half of the head line. Yes Patti, I can relate to what you described in your 2nd response (though that relates only to how the researchers described the Sydney line). I would love to hear your source as soon as you remember... all I know is that I never read any likewise statement regarding the Sydney line; I am only aware that the Sydney line has in nearly all books been described as just an 'extended' long head line. PS. I can add that I am aware that some scientific sources have described multiple Sydney line variants - including some examples with a large interruption and with crossing lines (both including one ulnar line). I'm riffling through my books that I thought might be the source. Haven't found it yet, but in Nathanial Altman's "The Palmistry Workbook" take a look at two examples if you have a copy. Figure 6.1: Described as "long clear head line" We'd most likely classify it as a Sydney. The only place where I can discern it as two creases might be in the space between the index and middle fingers. Figure 9.1: Description is of a broken life line. Image appears similar to Simian 4 or 5. There is also a fairly deep (for this hand) crease incoming on the ulnar side but it does not meet the head line as the head line curves downward. Would you consider this hand some kind of variation? I've printed out the pdf copy and will study it more carefully to better understand the particular details in the so called "Suwon Crease". Gosh! Wondering why I'm feeling somewhat agitated about this. I think it's because I see something I've said frequently in the past few years. The scientific community will take up palm reading. Only they will rename all the components and combinations of hand features. These are not *new* hand features. Haha! I find myself now often mentioning relative to skin ridge patterns the approximate percentages found in the human population while doing readings -- soon we'll be adding similar percentages to the creases. p.s. finding this Suwon crease on University students shouldn't be as much of interest as to the grade average they obtain. If I'm following you right then the accessory crease that's on the radial side connects with the heart line and on the ulnar side connects with the head line, is a deep crease - not a fading out ending or fork/split. It appears to originate from the side of the hand, radial or ulnar and meets the other primary creases. I've still seen this in both forms. I've seen it on the heart line often. I do use my magnifying glass to discern that a crease isn't simply a splitting branch but a 'touching' incoming crease.